Halloween is coming, and it would be nice if we had a set of fresh activities for this occasion. Children remember everything, and it is pretty embarrassing when you recycle something and the children shout out- “I know this!!! We’ve already done it.” Or, “My sister told me that you did this last year with her.” To help you out a bit, here is a set of new activities for Halloween. In this post you can find a colouring activity for young learners, a new song with lyrics and a Halloween board game. I hope your Halloween lesson goes well. You can do several things with this song. First, you can ask the students to watch the video and sing along. Second, you can print the following worksheet and ask the students to listen and complete the lyrics. Play the recording at least twice. Third, especially with young learners, ask the students to do some physical activity whenever they hear the word “Halloween”. Better hope you don’t die of fright! You know there’s room in my coffin for two! My friend Jason better known as Fluency MC has created the following rap song. First students listen and complete the following worksheet with the lyrics. At the end of the activity you can display the following questions and ask your students to work in pairs and ask and answer the questions. What are you going to do on Halloween night? The lyrics above contain a lot of words connected with Halloween. It might be a good idea to exploit them. 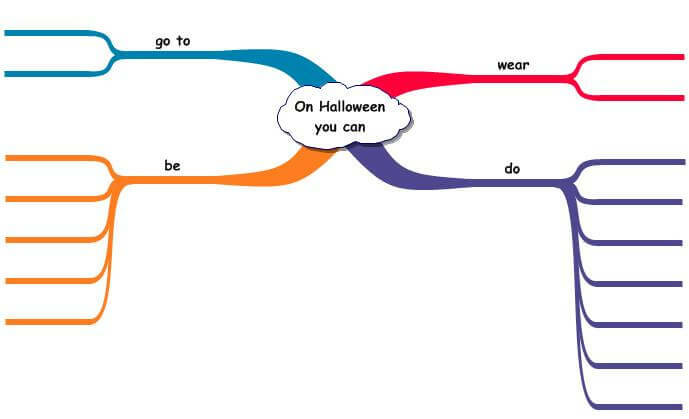 Print the following mind map and ask the students to complete it with the words from the song. Here is a speaking activity for elementary students. Print the worksheet and hand out the tables. Students work in pairs or in groups of three. If they work in pairs cut the first page and give each student one of the tables. If they work in groups of three print page two and cut the paper in three and hand them out. Students must not look into their partner’s worksheet. They ask questions in present simple and complete their tables. They must speak English all the time. Young learners of English like to colour. However, every colouring activity should be educational. In the following activity students will practise colours and parts of body. First, print the worksheet. There are two pages. Students should work in pairs, and within each pair the students should have different worksheets. Check that the children remember the colours and parts of the body, and ask them to colour the pictures according to the instructions. Next, ask the students to tell their partners what colours they used. The other student listens and colours the pumpkin in their worksheet. When they finish, they swap roles. In the following game students should practise their speaking and Halloween vocabulary. The rules are simple. Students should play in groups of three or four. Students place their tokens wherever they like in the haunted house. They throw the dice and move in one direction. They can change direction only at a crossroads or at the end of a corridor. The aim of the game is to collect as many ghosts as possible. If they land on a ghost, they get a card with a ghost. If they land on a TREAT or TRICK, they draw a card. TREAT cards contain a task the students have to do (usually telling a story.) At the end of each TREAT card there is a REWARD section which states the maximum number of ghosts the student can get. The other students listen and then decide how many ghosts the student deserves. A TRICK card just says whether the student receives or loses some number of ghosts. Set a time limit (15 minutes should be fine), and finish the game.